A man trying to recover his drone managed to get stuck up a tree close to a railway line, and had to be rescued by emergency services. Network Rail has urged people not to fly drones close to railway lines, as Southern confirmed trains were delayed to and from Brighton after the incident this afternoon (November 14). 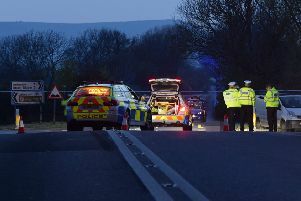 British Transport Police and East Sussex Fire and Rescue Service were called to the scene to help rescue the man. Posting a picture of the rescue on Twitter, Network Rail South East said: "This man needed rescuing after he got stuck recovering his drone from the railway in Brighton just now, delaying @SouthernRailUK passengers. Please, don't fly your UAVs around the line. Thanks to @BTPSouthEast and @EastSussexFRS for their help." Southern tweeted: "Due to a member of public getting stuck up a tree next to the railway line in #Brighton today (we're not joking), services to and from this station may be delayed by up to 10 mins."